You are here: Home › Oral Health Blog › General Dentistry › When Do You Need to Remove Your Wisdom Teeth? The chances are that you or someone you know personally has had their wisdom teeth removed. And, if your experiences have been anything like my own, not a lot of people have very positive things to say about the procedure! You might be wondering, “Do wisdom teeth have to be removed?” The truth of the matter is that almost everyone has to undergo the procedure. Some people, however, never have to get these teeth taken out. There are ways you can tell if they really need to be removed or not. So what exactly are your wisdom teeth? These teeth are the very last of your teeth to grow in and break through your gums. They are located the furthest back inside of your mouth, and there are four of them. There is one on the top and one on the bottom on both sides of your mouth. The actual age that your wisdom teeth finally grow in can vary greatly, but they usually first start forming in your teen years. By the time you’re in your late teens, the crowns of your the teeth usually start to erupt through your gums, if there’s enough room for them to do so. If your wisdom teeth are positioned properly and totally healthy, they can actually be a pretty valuable asset to your mouth. However, more often than not, they usually end up causing a lot of people more hassle than help. When your wisdom teeth erupt through your gums, they often cause a dental condition called “crowding,” which, for a lot of people, can lead to abnormal development. There are a couple of different degrees of wisdom teeth impaction. In some cases, they can be partially impacted. This condition occurs when part of their crown is actually showing through the gums. In other cases, they can be what’s called “fully” impacted. This condition occurs when they have never actually broken through your gum line. Whenever your wisdom teeth are partially or fully impacted, there is always a risk of developing dental complications. These dental complications caused by impacted teeth can initially begin with symptoms like mild pain and bleeding gums. 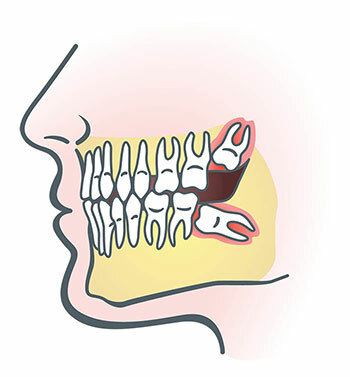 Now, not everyone has impacted wisdom teeth. And although it’s common for experts to recommend that you have them extracted early on even if you have not yet had any problems with them, if you do not have any symptoms, only a dental office visit can determine if you truly need an extraction. For starters, these teeth usually come in in one’s late teens or early 20s. If you’re younger than that or well past your early 20s, the chances are that you don’t have wisdom teeth. Now that you are aware of the signs and symptoms that you may need to have your wisdom teeth extracted, contact us at (253) 770-0198 to schedule an appointment Puyallup dentist or contact us via our online contact form right away if you are experiencing any of these symptoms.